It’s in our nature as humans to connect and interact with others. But for too many - especially introverts - it can be daunting and intimidating. Others simply don't have the time or knowledge. But running a business can be a strenuous and lonely feat, and having the support of a local community is vital. If you proactively seek knowledge and fully harness the value of networking in business, it could be could be the catalyst to exponential growth. 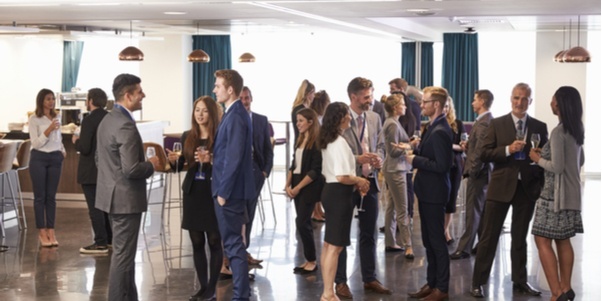 This blog post aims to draw out some areas of focus to make your next networking event count, so you can gradually overcome those common fears and obstacles. To those whom consider themselves fundamentally shy, the idea of being in a room full of strangers is deeply unpleasant. If this is the case, it's better to focus on ideas and information rather than people. For example, if you give yourself a goal for the evening, something like: 'I'd like to find out more about X in my region', the focus will soon shift from those unfamiliar faces, to the opportunities that'll bridge your knowledge gap. On arrival, make sure your conversations lean towards achieving this goal. When talking about something that genuinely interests you, it bolsters your confidence, as passion will always overcome shyness. It's amazing what a shift in mentality can do. Networking shouldn't be a selfish encounter - it's not just about making valuable connections for yourself. This type of tunnel vision can blur opportunities for potentially productive relationships. Perhaps you could facilitate a relationship yourself? Are there individuals you feel you could help by recommending valuable connections to them? Could you temporarily mentor a younger member of the community? Although your intentions might be fully altruistic, there's a chance your goodwill will be remembered for years to come. Opportunities to increase brand awareness are abundant, and not always reliant on costly advertising and marketing. What it comes down to is putting yourself out there. Networking events are a great way to do this, by showcasing your business in front of a pool of like-minded professionals and prospects. Perhaps you could sponsor an event, or present and speak? Seeking to share valuable insights or educative information about your business mission will enhance your profile, as others begin to understand the value in your offering. Plus, people like people, so it's always a good idea to put a face to a...business. Practice makes perfect, and the more networking events you attend the better you’ll get at it. Whether you're an introvert or a networking pro, everyone needs to start somewhere. So if you're a beginner, attend whatever you can in a bid to suss out what you really want to gain from attending an event. That way you'll know what to look for in the next one. Not all events will be the same, so through trial and error, you'll ascertain which styles of events are better suited to your business goals. This is not a hard-selling opportunity, but if you listen out for the pain points of potential prospects, or opportunities to collaborate with other businesses, it will likely empower you with a new perspective on business development. Talking about how your business can provide tangible solutions to prospects' pain points is far more effective that simply talking about how great your business is. Seeking to provide valuable answers and solutions will help you stand out as a thought leader in your field, gaining trust and authority. Knowledge is a valuable commodity. And quite often, those who attend networking events are not just looking for connections but also, valuable knowledge from their peers. Can you share game-changing experiences or helpful knowledge you’ve acquired to steer others in the right direction? Not only will this be a great way to break the ice, but it could lead onto another topic that directly underpins your goals. It’s amazing what conversation can do to stimulate the mind. The 21 year old, hipster-looking creative may on the surface, appear to have no direct interest in you or your business, but it’s important to be weary of pre-judging based on age, gender or appearance. You’d be surprised to find out that some of the most unlikely candidates hold the strongest networks themselves, and in a direct recognition of your acceptance, hold you in high regard in future. And it is just that: the cultivation of productive relationships. It requires preparation, confidence, and often, approaching a fear of the unknown. But the extracted value is relative to effort invested. Tidying up your approach and maintaining an open-mind with a focused goal is the underpinning attitude that can lead to longevity in growth and expansion, as relationships and connections can serve you for years to come.